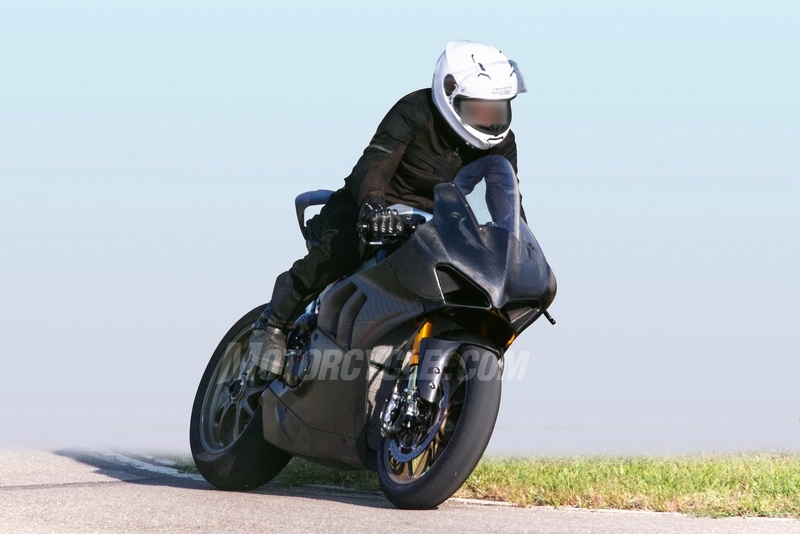 According to the posts on Motorcycle.com and Asphalt and Rubber, we may be quite close to the unveiling of the Ducati Panigale V4 R. The V4 R is going to be the 1000cc version (to meet WSBK homologation requirements) of the Panigale V4. 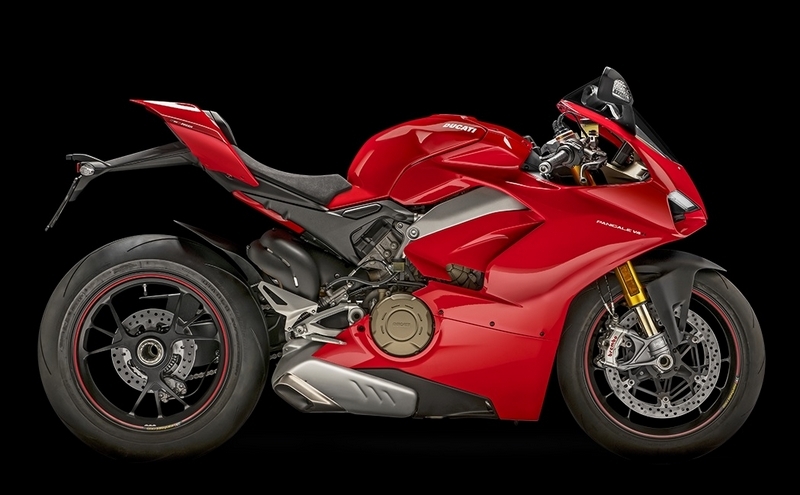 As a result of this, Panigale V4 R will be the basis of Ducati’s superbike racing efforts. 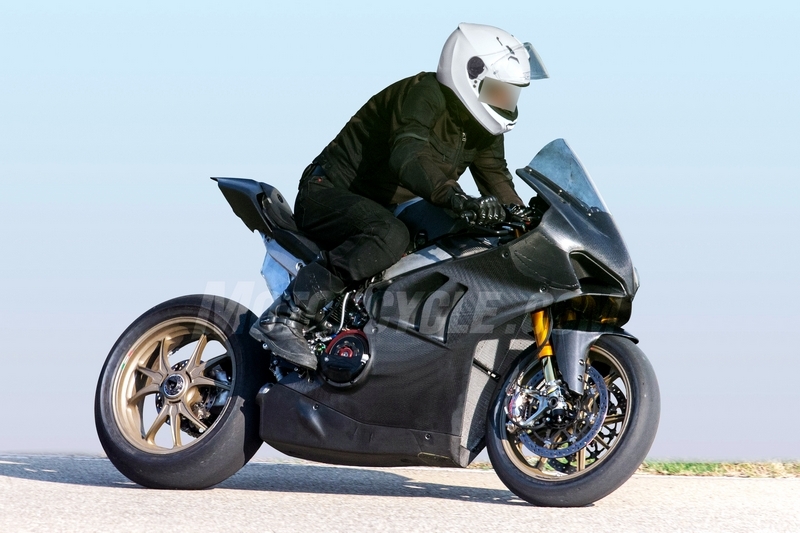 The motorcycle spied, and being tested in the British Superbike round at Brands Hatch, seems like the race-spec version according to the data acquisition equipment on board, the look of the rear subframe, lever guards, the carbon fiber faring and the lack of lights and mirrors. 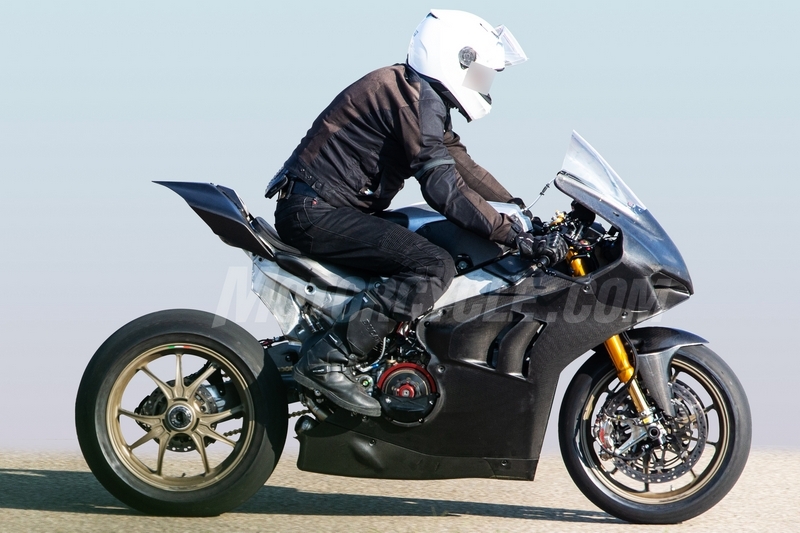 The fairing design seems different there are gill-like cutouts on the fairing, that maybe for aerodynamics or heat dissipation as the Panigale V4 seemingly suffers from heat issues. 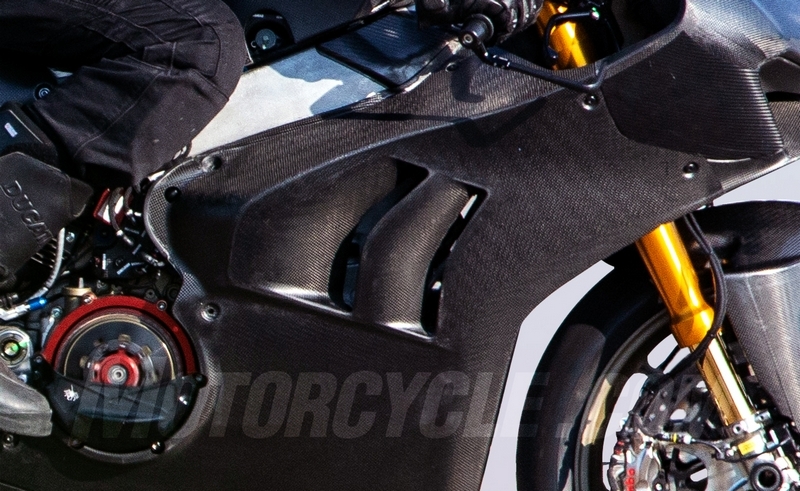 Fairing also seems to have mounting points which may be for the installation of aerodynamic winglets. The dry clutch also strengthens the fact that it is a race-spec machine. Other noticeable things are the forged magnesium Marchesini M9RS wheels and Brembo brakes. In the test run on Brands Hatch, the test rider is Ducati MotoGP test rider Michele Pirro, who undoubtedly has been helping hone the superbike for its true racing debut next season, in the World Superbike Championship. Mechanically, the bike will have a 1000cc V4 engine with desmodromic valves, a counter-rotating crankshaft, and big-bang firing order. It will supposedly make around 210 bhp of power. 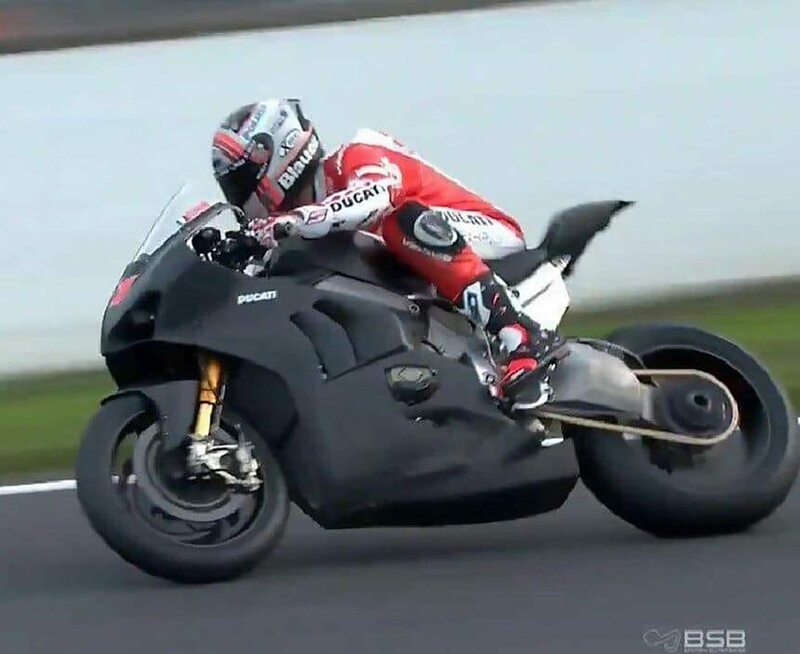 From what we’ve heard from earlier testing sessions, the Ducati Panigale V4 R shows really good power on the track, even in its earliest of forms. As such, we imagine the bike will be a contender right out of the box when it debuts next season. In the Indian sub-continent, the Panigale V4 S has broken the production bike lap record at the Buddh International Circuit. Ducati’s test rider, Alessandro Valia, managed to lap the 3.2-mile track in 1.56.316, breaking the record for a production bike that was previously held by a Yamaha R1. That is blisteringly fast because when one runs the numbers, the track record for production cars is currently held by the Mercedes-AMG GT R, which set a lap time of 2.09.853. The fastest lap record for a car at BIC is held by a Ferrari 458 Challenge race car with a lap time of 1min 59sec. Alessandro Valia said that he could have gone faster but had to stop because of a bent gear-lever. Oh, Alessandro, you don’t go leaning that far on a stock production bike (with the exception of slicks) without hurting the poor thing. Valia was here teaching during the Ducati Riding Experience (DRE) session. Last edited by NewsReaper; 10-16-2018 at 06:10 PM.